The First Crusade (1096-1099) - The subject of the Crusades is a vast and controversial one, and could fill the contents of an entire website all by itself. For the sake of brevity, this timeline will attempt to compress the Crusades into a manageable summary that still conveys the events in a coherent manner. Its roots can be found in the rise of the Seljuk Turks as a self-governing people. Turkic tribes originated from the Steppes of Central Asia, but for centuries remained a disjointed group of people. That changed in the 11th century when the Seljuks (just one of several tribes) established their own sovereign kingdom. They became Muslims with the spread of Islam by the Arab conquerers in the previous centuries. However, they quickly developed an independent streak to separate themselves from both Arabs, and Persians who had ruled over them for so long. Not only did they become independent, but they also became expansionistic. In 1071 they dealt a serious blow to the Byzantine Empire at the Battle of Manzikert, under the rule of one of their early leaders, Alp Arslan. Two years later they wrested the Levant, including Jerusalem, from the Fatimid Caliphate. This changed everything. Under the Fatimids, non-Muslims enjoyed a tremendous amount of acceptance. Jews and Christians by and large could travel to Jerusalem freely with little fear of persecution. But the Seljuks were not so tolerant. Over the next decade, thousands of pilgrims to the Holy Land were killed, and numerous churches destroyed. That, plus the encroachment upon Byzantine territory prompted Emperor Alexius Comnenus to request aid from Western Europe (see Council of Clermont above). Within months of Clermont, the First Crusade began. There are many important figures of the First Crusade. Some were responsible for spreading the word of Pope Urban's call to arms. 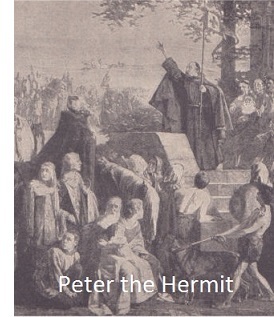 The most famous was a man named Peter "the Hermit". He traveled throughout the French countryside and preached the virtues of a crusade in the East to anyone who would listen. According to some accounts, Peter's motivation was personal. He had previously attempted several pilgrimages to Jerusalem, but was denied passage each time. So for him, an armed invasion is exactly what was needed, and he fervently said so. The idea of a crusade against the Muslim Turks caught on like wildfire. Most of the people alive at this time were dirt-poor peasants, and an armed conflict for a holy cause meant adventure as well as a shot at becoming rich. 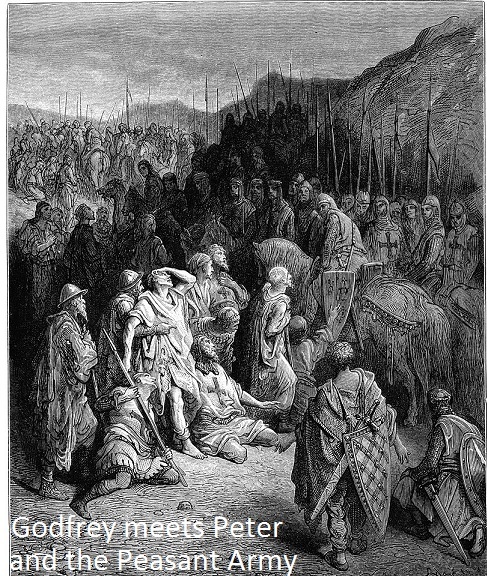 Peter's efforts initiated a first wave which became known as the People's Crusade (or sometimes Peasants' Crusade). This was an undisciplined, mostly untrained army of ill-equipped laymen, and small number of lower class knights who were eager to get started. With almost no personal belongings, they set off immediately and headed east. It was a huge army of about forty-thousand horribly disorganized "soldiers". Leading the force was Peter himself and probably the most experienced knight among them, Walter Sans-Avoir ("Walter the Penniless"). To get to Byzantine territory, they had to travel through Hungary. Their unpreparedness quickly became evident. Lacking supplies as well as money, they turned to looting in order to feed themselves. This resulted in some armed conflict before they even reached enemy territory. The worst incident occurred in Semlin where 4,000 innocent Hungarians were killed. Fearing retribution from King Coloman, the peasant army moved through the remainder of Hungarian land as quickly as possible. It reached the Byzantine Empire at the end of June, 1096. By this time, Emperor Alexius was well aware of the peasant army's approach and, in order to prevent a similar scene, hurried it through his kingdom as quickly as possible. It's not really worth devoting much time to the campaign of the peasant army because it was so inexperienced, that the Turks crushed it as soon as they decided to take it seriously. After crossing the Bosphorus and landing in Turkish terrirtory, it captured a number of small towns and had free reign for about six months. But as soon as the Turks, under the command of Kilij Arslan, showed up, the peasant army was wiped out in about two battles. And so ended the People's Crusade. Much more serious was the better organized army of well-trained knights that would follow. It took longer to mobilize because it consisted of rich land owners who had to make preparations for their extended absence. Without going into any depth, it must be mentioned that many Jews were persecuted (and some even killed) at this time. In order to fund their campaigns, the knights had to loan out or sell much of their land, and many of the wealthy merchants needed to raise the money were Jewish. Some of the knights resented their wealth and decided to extort it from them instead of engage in honest business practice. Some gave in to the extortion, and some didn't. Those who didn't were the ones who were killed in many cases. Finally, in late summer 1096, about the same time the peasant army was being slaughtered in the Middle East, this well-trained, well equipped army was ready to leave. Because knights were raised from all over Europe (mostly France), and because of the feudal system in place at the time, each knight served a local lord, and, as a result, many leaders emerged, instead of just one single overall commander. 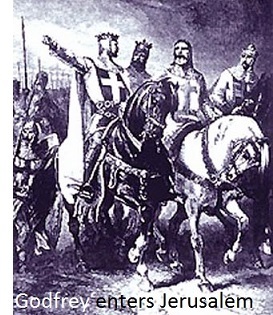 The list is long, so I will only mention the most important lords who led the crusader army. The first to commit (but ironically the last to leave) was Raymond, Count of Toulouse. He was nearly sixty years old at the start of the crusade and one of the wealthiest men in France. As a result, he tried to assume the role of supreme commander, but his lack of leadership skills prevented that from happening. Perhaps the man who came closest to achieving that position was Godfrey of Boullion, Duke of Lower Lorraine. He was a descendant of Charlemagne himself, but second son to Count Eustace of Boulogne. As a result, he didn't have much of an inheritance to look forward to, so he joined the crusade to seek his fortune. Joining him was his younger brother, Baldwin of Boulogne. In his youth, Baldwin was earmarked for the clergy (as the youngest son, he had almost no chance at becoming a ruler); but he proved too worldly for the Church. Godfrey and Baldwin were said to be complete opposites in almost every respect save one. Both were very able warriors. But even they had to concede the title of "greatest warrior" to Bohemond of Taranto. Bohemond was a Norman from Southern Italy, and perhaps the most renown knight in all of Europe. About forty years old at the time of the First Crusade, he had campaigned against multiple adversaries in his career, even Byzantine Emperor Alexius, whom he was now to become allied with. In addition to these military leaders, there was one other who joined the army. He was Bishop Adhemar of Le Puy, the undisputed spiritual leader of the crusade. Appointed by Urban II, he was the Pope's representative and traveled with Raymond's men. In all, there were four main Crusader armies which, when added up, totaled about 30,000 to 35,000 troops. Raymond had the largest force with about 8,500 infantry and 1,200 cavalry. They traveled to Constantinople by one of two routes; either by land, as the peasant army had done, or by sea across the Adriatic and Aegean Seas. Unlike the People's Crusade, however, this army was well-financed and well-organized, and as such, created fewer disruptions en route to the Holy Land. However, that did not mean it did not present problems for Emperor Alexius. To distinguish it from the People's Crusade, this second wave is sometimes referred to as the "Princes' Crusade". And that was the threat it represented. Would they fight for Alexius or for themselves? To insure the former, Alexius intended for the leaders of each of the armies to swear an oath of loyalty to him. It took the threat of withholding provisions, but in the end, some form of an oath was sworn by most the men to the emperor (the two exceptions were Raymond, who simply promised to do no harm to the empire; and Tancred, Bohemond's brother, who crossed into Asia at night to avoid taking the oath). With that formality accomplished, the bulk of the crusader army was ferried across the Bosporus into enemy territory. It's worth noting that Peter "the Hermit" as well as a small contingent of the peasant army survived the slaughter at the hands of the Turks and remained tucked away in a corner of Anatolia until the second army arrived. They could neither go forward nor go back, and so were stranded in a type of "no man's land" surviving on whatever sustenance they could gather. When the Prince's Crusade reached them, they were added to their numbers and probably served as support units to the more experienced army. Peter traveled with them, but his significance to the crusade from that point diminished. The first target was obvious...Nicaea (today Iznik). It was a Turkish city, it was right across the Bosporus and it was the capital of Kilij Arslan, the man who defeated the People's Crusade. At the time, Arslan was in eastern Anatolia campaigning against another Turkish tribe, the Danishmends, who were trying to infringe on the Seljuk's eastern border. When word arrived of a new crusader invasion, Arslan dismissed it. The ease with which he had crushed the peasant army created in him a sense of disrespect for European soldiers, and he believed the city's defenses would hold. The Crusaders arrived at the gates of Nicaea on May 6, 1097 and surrounded the city. They laid siege to it for six weeks and were on the verge of capturing it. But on the morning of June 19, on a day when they had hoped to finally take possession of the city, they awoke to find the Byzantine flag flying above the city walls. Unbeknownst to them, Emperor Alexius had been secretly negotiating with the Nicaeans and he convinced them to surrender. From their perspective, it was better to give up the city and live, than to be slaughtered at the hands of a raging army. The consensus is that the crusaders were furious with Alexius for going behind their backs and depriving them of the spoils of war. To mitigate the bad feelings, he rewarded them with generous gifts, but the perception had been created that Alexius could not be fully trusted by the Westerners. Now the trek toward Jerusalem was underway. As it traveled further and further from Constantinople, supplying the army would become more difficult. So it broke into two in order to allow greater opportunity to gather provisions from the countryside. The advance force was the Norman army led by Bohemond and his brother, Tancred. Raymond, Godfrey and Baldwin led the other, primarily French, army. The first major battle took place at Dorylaeum, and it was a doozy. The Norman army made camp on June 30th. Kilij Arslan, stinging from the loss of Nicaea, had tracked the crusader army and attacked it on the morning of July 1st. No longer complacent, he brought a large force and was intent on destroying the invaders once and for all. In a scene reminiscent of the Battle of Carrhae more than a thousand years earlier, the Turkish army encircled the Norman camp with horse archers and began lobbing arrows into it. 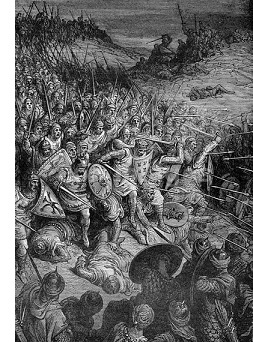 The Norman army could very easily have been slaughtered. But Bohemond was a warrior of great repute, and now he had the chance to prove it. He managed to slip a horseman out of camp before the Turks completely surrounded it with the mission to locate the other army. Then he ordered his men into a defensive circle around the camp and told them not to break ranks no matter what happened. In the center of the camp were the non-combatants who kept the soldiers well supplied with water and arms. They held out all morning and into the afternoon. Even so, the Seljuk army began closing in and had the crusaders on the brink of annihilation. But at that moment, in the distance was seen a cloud of dust being whipped up by the arrival of the second army. The messenger had been successful. It advanced on the Turks, and the camped soldiers, seeing their comrades, finally broke formation and charged the enemy. The Seljuk archers were now caught in a vice, and they fled the battlefield before they themselves were completely annihilated. Chroniclers of the Crusade single out Bishop Adhemar as being particularly effective. On the approach, the holy warrior outflanked Arslan's men and expedited the retreat. Losses on both sides were about equal, but in their retreat, the Turks left behind a fair amount of treasure and provisions. The march on Jerusalem could now continue relatively unopposed. But the Turks were not the only enemy. The Crusaders were completely unprepared for the harsh desert climate and they suffered as many casualties from the heat as from the Muslims. Despite the conditions, they traveled on until they reached Antioch, which lay about half-way between Constantinople and Jerusalem. Antioch was considered one of the founding cities of Christianity; it is the location where followers of Christ were first called Christians. So the crusaders were determined to capture it. All except for one. Baldwin's wife and child were two of the travelers who succumbed to the harsh conditions (many of the knights brought their families with them), and this cut Baldwin's ties to his home in Europe. So upon reaching Antioch, he abandoned the main army and set out to establish a permanent residence right there in the Levant. He and his men turned East and went to the Armenian city of Edessa, about 150 miles (241 km) away. Edessa was ruled by King Thoros, a Greek Orthodox Armenian. Thoros welcomed Baldwin as an ally, and eventually, the two became so close that, in February 1098, he adopted the crusader as his son and heir. Only a month later, Thoros was assassinated. The urge to tie Baldwin to the assassination is irresistible; however, any direct evidence (if there was any) has been lost to history, so we'll never know for sure. In any event, Baldwin became the Count of Edessa, establishing the first official "Crusader" Kingdom in the Middle East. Meanwhile, the rest of the knights were besieging Antioch. It took eight months before it finally fell in June 1098. But not by assault. 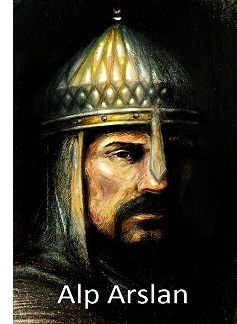 Bohemond bribed an Armenian guard named Firouz, who allowed his men to scale the tower at which he was posted. They opened the city gates and the entire army swarmed inside. After eight months of siege, the Crusaders were near starvation and they took their frustration out on the city. Virtually every Turk was slaughtered, with many of the city's residents assisting in the massacre. Most of them despised the Turks whom they viewed as occupiers. However, in the frenzy, many innocent townspeople, including Christians were also killed. The Turks launched a counter-attack led by Kerbogha of Mosul, but it was repelled. Antioch, the greatest prize next to Jerusalem, was now in Crusader hands. But, in the process, the relationship between Emperor Alexius and the leaders of the Crusade had changed. They believed that he had abandoned them to their own fate and, as a result, some renounced their oath to him. Principal among them was Bohemond, who decided to claim Antioch for himself. Thus, after Baldwin, he established the second "Crusader" Kingdom. Now all that remained was Jerusalem itself. But before they embarked, the Crusaders suffered a terrible tragedy. A plague (possibly typhoid) swept through Antioch, killing many, including Bishop Adhemar on August 1, 1098. The loss of Adhemar was a devastating development. As the spiritual leader, he brought a cohesion to the army that the other leaders could not provide. They were driven more by self-ambition, and now with Adhemar gone, their personal ambitions could no longer be kept in check. He must have provided the moral conscience of the army as well, for after his death came the tale of the worst atrocity committed during the First Crusade. As winter approached, the army was running dangerously low on supplies. The soldiers were near starvation and they resorted to a most drastic and devastating measure. They attacked the nearby city of Ma'rra and massacred the entire town. Finding its provisions lacking, some of the men reportedly resorted to cannibalism in order to survive. Finally, in June 1099, the Crusader army arrived outside the walls of Jerusalem. With about 13,000 soldiers, it was less than half of its original size. Of course, Baldwin and Bohemond had remained behind in their respective cities, and the assault was led by Godfrey and Raymond. However, in the time between the initial invasion, and this moment, Jerusalem had changed hands. The Fatimid Caliphate, from whom the Seljuk Turks took the Holy Land, had been monitoring the war between their old enemy and the Crusaders, and determined that the Turks had been severely weakened. It launched its own invasion into the Levant and captured Jerusalem the year before. The Fatimids did not consider themselves at war with the Crusaders and attempted to reach an agreement with them. But the Crusaders had come too far to be denied their prize. They would settle for nothing short of control of Jerusalem. Part of the reason the Fatimids tried to prevent a battle is because they did not have sufficient troops to fortify the city after they had taken it from the Turks. As a result, the Crusaders captured Jerusalem after a month long siege of the city. They killed every Fatimid soldier and most Muslims as well. Many Jews, who fought along side the Fatimids were also killed, as were some Christians as well. The Crusaders established the Kingdom of Jerusalem, and Godfrey became its ruler, though he refused to take the title of king. The Crusade had achieved its objective of capturing the Holy City, but in the process, had unnecessarily made an enemy of the Fatimid Caliphate. This insured the prospect of more Crusades in the future.